The insert for this reissue of two Bartók performances from the early seventies reveals the fact that this is a most unusual affair, which results in the following unusual joint review. There is not a word in the booklet introducing or describing the music itself; rather the preoccupation is only with the Concerto for Orchestra recording sessions and the techniques involved. At the top of the cover page, above the details of the music and the performers, it heralds: 'The Symphony Orchestra in Quadraphonic Sound; A New Chapter in the History of Recording.' Such was the enthusiastic description provided by the CBS marketing department in 1972 at the time of the initial release. In the end Quadraphony proved to be a false dawn – or a blind alley. Either metaphor might apply, but at any rate the approach disappeared. Now Dutton Epoch have joined Pentatone and others in reissuing these 1970s experiments, and offers high-resolution SACD Surround and Stereo, plus a standard CD layer. For once format issues become especially important. There is no question that for maximum effect and for maximum musical enjoyment, the surround sound option is the only one that is satisfactory. Dutton have honestly and very successfully transcribed the original recording using just 4.0 of the available 5.1 channels of modern SACDs. There was no concept of a centre channel (or .1 effects channel) in the days of Quadraphony and though three channel recordings (L/C/R) had been made by RCA and Mercury in the mid-50s, they did not see the light of day until SACD in the 2000s. The CBS way (American Columbia was known as CBS outside the USA to avoid confusion with the EMI Columbia label), in the period when this recording was made, was to use plenty of close microphones and while these can sound very exciting and provide quite specific placement, they do, on this occasion, lead to some strange results in stereo. Thomas Z. Shepard is quite open in his contemporaneous technical notes, explaining they moved instruments between tracks for specific effects so one need not be surprised. However when the end result is mixed to stereo and the listener is unaware of the 4-channel experiment that this issue represents (and who reads long technical notes?) it can suddenly appear quite at odds to the usual platform seating arrangements: flutes and first violins sometimes on the right, trumpets sometimes on the left, while the extra-close microphones frequently turn the woodwinds into the loudest of the orchestral departments. The present reviewers' thoughts on the performance are similar. Boulez and the New York Philharmonic do present top class performance standards. The Concerto for Orchestra was written as a showpiece for a great American orchestra, the Boston Symphony, and so all the players are challenged to be at their best, both individually and together. In that sense there is plenty of virtuosity to admire, enhanced and perhaps exaggerated by the close microphones and odd placements. This may worry some listeners more than others, but it does raise the question of whether Bartók's considered orchestral balances have been compromised. In The Miraculous Mandarin the issues are different and the surround sound is altogether more subtle. The performance is keenly observed although there could have been more intensity in terms of drama. The recorded sound is not as vivid as this score ideally demands, and it is in the more poetic moments that the music sounds best. 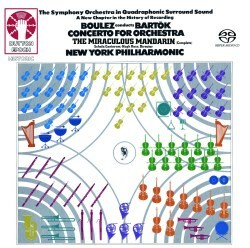 When Columbia/CBS issued the original LP of Mandarin, a year earlier (1972) than the Concerto for Orchestra (1973), the stereo came out followed a little later by a separate SQ Quadraphonic version, which had clearly been remixed to enhance an essentially stereo recording. Only now can we hear how well they handled this new technology for the rear channels never draw attention to themselves, they just add depth. Returning to the subject of Dutton's accompanying booklet, it fully explains the pioneering attempts at surround. To assist this, it comes replete with charts, diagrams and a photograph taken at one of the Concerto for Orchestra sessions. In surround sound it certainly makes for entertaining listening today, the better part of fifty years on from when the recording was made. But in the stereo of the Concerto, not Mandarin, EMG's original comments still apply: be warned.